In October 2010, MAC published an article where Philippine activists were pressuring the Human Rights Commission (CHR) to release their report on the OceanaGold mine. The CHR has now issued its recommendations, and they are highly critical of the company (listed below, with a link to the pdf attachment here). The first recommendation is that the government "look into the issues presented herein and consider the probable withdrawal of the FTAA [Financial and Technical Assessment Agreement i.e. the license agreement] granted to the foreign company in view of the gross violations of human rights it has committed. A local indigenous leader noted: "We suffered much because of OceanaGold's operations. It's good that the CHR took our side against it". The company, however, has responded to say it is committed to human rights and will push through with the operation. MANILA - Two years after it conducted investigations, the Commission on Human Rights (CHR) found foreign-owned OceanaGold Philippines Inc (OGPI) guilty of violating the rights of residents of Barangay Dipidio, Kasibu, Nueva Vizcaya. The Australian company has a Financial and Technical Assistance Agreement (FTAA) with the Philippine government. OceanaGold's FTAA covers 17,626 hectares of mineral lands in Didipio. In December 2008, OGC stopped their mining development in the area because of financial trouble, disapproval of local government units, and strong community resistance. The situation reached a critical point in October 2009 when in an attempt to demolish several houses, more than a hundred PNP members used truncheons, shields and tear gas to disperse residents protesting the operations. Among those who fought against the demolition team were the mayor of Kasibu and the baranggay chairman. After a review of all information and documents it gathered, the CHR declared that OceanaGold had committed a number of violations against Dipidio residents, including their Right to Residence, Right to Adequate Housing and Property Rights, Right to Security of Person, Right to Freedom and Movement and the Right not to be subjected to arbitrary interference. The CHR said that the company also violated the residents' right as members of an indigenous group to manifest their culture and identity. Commissioner Jose Manuel S. Mamauag said the resolution should serve as a "wake up call" to all other mining corporations. He said that the Dipidio case throws light on how mining firms address the welfare of the people in the areas where they have operations. "This entire case makes us ask for whom is national development for. Does it serve national development to throw away the cultural identity of our indigenous brothers and sisters? The policies that allow corporations to mine or harvest our country's natural resources should be regulated for the sake of the indigenous peoples and even those who do not belong to indigenous groups. We should say a firm ‘no' to giving blanket authority to any agency to allow mining firms to operate without seeing first what is best for communities, for residents, for the environment," he said. An Ifugao leader in Dipido, Tolentino Inlab, hailed the resolution, saying that it validated their complaints. "We suffered much because of OceanaGold's operations. It's good that the CHR took our side against it," he said. Another resident, Lorenzo Pulido, said that because of the CHR's intervention in 2008, the company's abuses let up. "Now it has resorted to negotiating wth us, the community residents, trying to convince us to give up the land. We don't care to listen to what they have to offer - we have seen enough of OceanaGold," he said. Pulido expressed hope that with the release of the CHR resolution, the mining operations would come to a complete halt. "This is what we really want. No number of promises about development and improvements in our livelihood and income can ever be enough. We don't want this kind of development that comes at such a huge cost to our lives as indigenous peoples, and at the expense of the environment." In June 2008, residents filed a complaint with the CHR, asserting that the mining company illegally and violently demolished some 187 houses in Dipidio. Residents said the company did this without securing writs or special orders of demolition from the court. Company representatives also facilitated the demolition unaccompanied by the sheriff, without payment of just compensation, and without providing alternatives or options for relocation or resettlement for the residents. The demolition was also said to have been attended by unnecessary violence and destruction: residents said that when they resisted and defended their homes, they were beaten up by members of the demolition team. Houses were run over by bulldozers or set on fire. In their complaint to the CHR, the residents also said OceanaGold fenced off large sections of the roads and pathways which residents have been using for the past 30 years to transport produce from their farms to the market. The mining firm also set up checkpoints around the baranggay, causing unjust restrictions on the social and economic activities of the residents. It was also reported that the Philippine National Police (PNP) Regional Mobile Group served as a 'private security force' for OceanaGold, and policemen were stationed inside the company premises. In its resolution, the CHR said it would recommend to the Aquino government to consider the probable withdrawal of the FTAA granted to OceanaGold in view of the gross violations of human rights it committed. It also said that it would require all concerned agencies, particularly the National Commission on Indigenous Peoples , the Mines and Geo-Sciences Board of the Department of Environment and Natural Resources, the PNP and the Armed Forces of the Philippines to submit reports to the Commission regarding the concrete actions they have taken to respect, protect, and fulfill the rights of the people in Dipidio within 30 days after they receive copies of the resolution. The Commission also said that the company was also guilty of endangering the community's water resources and the residents' access to clean water. OceanaGold's gold-copper mining projects intends to produce 120,000 ounces of gold in its first 10 years of operation which also amounts to at least 3.846 billion liters of freshwater that would be expended every year for the next 10 years. Environmental activist group Kalikasan PNE for its part lauded the CHR's resolution, and said that the government should heed the Commission's recommendation for the withdrawal of the FTAA with the company. "Companies like OceanaGold that violate human rights and destroy the environment have no reason to stay and should not be allowed to operate in our country. President Aquino should immediately rescind the OGC's mineral agreement if he is truly concerned about the environment and if his ‘responsible mining' advocacy is pro-people and not pro-corporate," said Clemente G. Bautista Jr., national coordinator of Kalikasan PNE. "The local indigenous people's organizations, environmental groups, the local churches, municipal government, the provincial government, and even the lower house of Congress have the same findings and position as the CHR. We want OceanaGold to be kicked out of Nueva Vizcaya, it should pack up and go immediately. Only the corrupt and pro-mining administration of Gloria Arroyo allowed OceanaGold to stay in the past." Bautista explained that during the 14th Congress, the Committee on National Cultural Communities investigated mining operations in Nueva Vizcaya in 2008 and discovered that Oceana Gold committed several violations. The committee reported that the firm did not properly follow the required Free and Prior Informed Consent (FPIC) process, it violated the rights of the indigenous communities, and failed to report its FTAA to Congress which is required by law. The House committee also recommended the reprocessing of the mining agreement of OceanaGold. In the meantime, Defend Patrimony, a multisectoral alliance opposing foreign mining, said that the Aquino administration should prove that it is the opposite of the previous Arroyo administration, which, at the expense of indigenous peoples and the environment, had allowed foreign mining companies to plunder our mineral resources and degrade our ecosystem. Pia Malayao, an indigenous leader from Kalipunan ng Katutubong Mamamayan ng Pilipinas (KAMP) and spokesperson of Defend Patrimony, said the Aquino government should stop and reverse its policy of mining liberalization. "As long this policy continues, the operation of foreign mining companies would continue to result to human rights violations and displacement of indigenous people's communities," she said. explained. The Legal Rights and Natural Resources Center-Kasama sa Kalikasan (LRC-KsK) in the meantime said that the national government should hold the government agencies involved in the violations in Dipidio accountable. "The illegal acts and violations committed by OceanaGold, with the aid of other institutions should be immediately addressed for justice to prevail and prevent similar human rights violations in other communities also confronted with mining issues," it said in a statement. There was no immediate reaction from the company to the CHR's findings. Reports last month quoted OceanaGold officials as saying that the company would resume operations this month. "Preparations are now under way to reboot operations on the first half of 2011," OceanaGold chairman Jose Leviste told The Manila Standard in December. The paper also quoted Environment Secretary Jesus Paje as saying that OceanaGold "might start commercial production of its Didipio copper-gold mine project by 2013." "It's a good thing that OceanaGold may start operating by 2013. The company already has funding for the project," Paje said, according to the Manila Standard. In support of a Commission on Human Rights (CHR) resolution, an indigenous peoples' group on Tuesday called on President Benigno Aquino III to immediately cancel an agreement with a mining firm operating in Nueva Vizcaya province. At a press conference in Quezon City, Kasibu town residents led by the Didipio Earth Savers Multi-purpose Association (DESAMA) called on Aquino to revoke the Financial Technical Assistance Agreement (FTAA) awarded by the government to Australia-based OceanaGold Philippines, Inc. (OGPI) because the firm allegedly violated indigenous people's rights. "We are urging President Aquino to heed CHR's recommendations and the call of the indigenous people in Kasibu's Didipio village to revoke the OGPI's FTAA," said Tolentino Inlab, an Ifugao and DESAMA chairperson. A CHR investigation report said it found OGPI liable for violating the indigenous peoples' rights of Didipio residents to "residence, adequate housing and property" and the "right of the indigenous community to manifest their culture and identity." "The Commissions resolution is a validation of our complaints and we are grateful to Chairperson Etta Rosales and the Commissioners for this wonderful New Year's "resolution" (Gift)!" said DESAMA's Tolentino Inlab. The CHR Resolution No. A2011-004 was signed by Chairperson Loretta Rosales, and commissioners Ma. Victoria V. Cardona, Norberto Dela Cruz and Jose Manuel S. Mamauag on January 10, 2011. The FTAA allows OGPI to go on full-scale commercial production and utilization of gold, copper, nickel, chromite, lead, zinc and other minerals except for cement raw materials, marble, granite, sand and gravel and construction aggregates. The government issued the first FTAA in 1994 to Climax Arimco Mining Corp. and then to OGPI, covering more than 3,000 hectares of land in Barangay Didipio. DESAMA members and Didipio residents filed human rights violations complaints against OGPI in 2008. The firm has since denied the allegations. As of posting time, GMANews.TV's correspondent in Nueva Vizcaya is trying to contact OGPI for comments on the CHR resolution. In its Jan. 10 resolution, the CHR said, "The ultimate goal of economic development is to raise the quality of life of all people. To this end, the State promotes the full and efficient use of its human and natural resources by encouraging private entities to invest... However, when private entities violate the fundamental rights and entitlements of the people in the name of economic development, they not only lose their moral legitimacy, they also defeat the very purpose...."
Also, the resolution finds the "Philippine National Police-Regional Mobile Group accountable for violating its own operational procedures during the October 2, 2009 incident where they participated and used excessive force in suppressing the resistance of the indigenous community who banded together on that day to prevent the demolition crew in dismantling the house of their neighbors." The Commission also asked OceanaGold to ‘exercise great caution in exploiting the water resource of Didipio', where the possibility of endangering the ‘community's water resource for domestic and agricultural use' is great, which could ‘violate the peoples fundamental right and to access to clean water'. "OceanaGold's gold-copper mining project intends to produce 120,000 ounces of gold in its first 10-years of operation, which also amounts to at least 3.8 billion liters of freshwater, will be expended every year, for the next ten (10) years, sufficient enough to irrigate more than a hundred hectares of agricultural lands twice every year," the report said. For his part, Ronald Gregorio, team leader of Legal Rights and Natural Resources (LRC)-Luzon, also reminded Aquino of his promise to investigate the environmental degradation of the mountains in Nueva Vizcaya, now that the findings of the CHR investigation on Didipio is already out. Meanwhile, Alyansa Tigil Mina (ATM) lauded CHR's resolution, which reflects the strong stance of the commission to protect and defend human rights. In a statement, ATM said this should serve as a valuable lesson to large multi-national companies who continue to deny the indigenous peoples of their right to free, prior and informed consent. Meanwhile, the Legal Rights and Natural Resources Center-Kasama sa Kalikasan/Friends of the Earth Philippines (LRC-KsK/FoE Phils) welcomes the CHR resolution. LRC-KsK/FoE Phils serves as the legal counsel of DESAMA. The LRC, together with other organizations, is also involved in the overall advocacy to stop the implementation of the government's mining revitalization program that places our economy in a disadvantaged position economically and our environment in jeopardy. Australian miner OceanaGold Ltd said on Thursday it was committed to pursuing commercial production of its Didipio gold-copper project in the Philippines by early 2013, as it declared compliance with all local laws. The company also said it upheld "ethical, responsible and sustainable" mining, in reaction to a recommendation by the government's human rights body that Manila take back Oceanagold's mining rights for violating rights of indigenous people. Australia's fourth-largest listed gold miner said in a statement it was concerned the human rights agency did not formally notify the company of its recommendation before the report was made public. "The company insists it has met, and is committed to continuing to meet, the human rights of the local community," it said. Company Chief Executive Officer Mick Wilkes said in the same statement: "The company is firmly committed to building strong and enduring relationships with our community in the development and ongoing operations of the Didipio project for the benefit of all stakeholders." Loretta Ann Rosales, head of the human rights commission, said on Monday the agency found OceanaGold had violated indigenous people's right to adequate housing, freedom of movement and manifest their culture and identity. 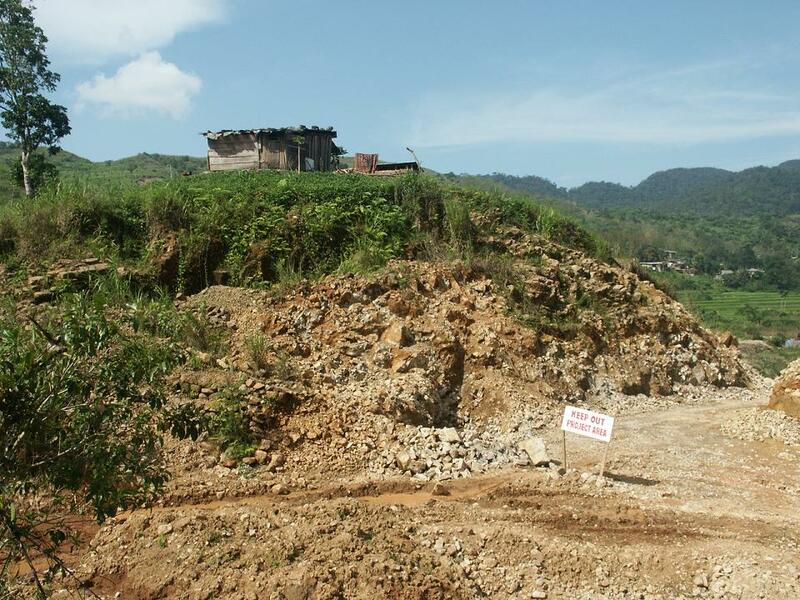 The Didipio mine in Nueva Vizcaya province north of the capital has a reserve life of 20 years and holds 1.41 million ounces of gold and 169,400 tonnes of copper, based on a report released last year by OceanaGold. In October, OceanaGold said it would restart work on the project in the first half of 2011, with initial capital cost estimated at $140 million. The firm did not give a final capital spending estimate on Thursday but said it was on target to begin production by 2013. It halted construction in late 2008 on high cost estimates for Didipio's development, initially seen reaching $320 million. Manila wants to promote mining to lure more foreign money and boost jobs, but opposition from the Catholic church and indigenous people due mainly to the environmental impact of the projects have resulted in slow investments in the sector. The ultimate goal of economic development is to raise the quality of life of all people. To this end, the State promotes the full and efficient use of its human and natural resources by encouraging private entities to invest in key industries and business enterprises. However, when private entities violate the fundamental rights and entitlements of the people in the name of economic development, they not only lose their moral legitimacy - they also defeat the very purpose for which they were given authority to conduct business. The present case is a classic and lamentable example of how economic aggression denigrates the most basic of human rights. This case is about the alarming human rights situation in Barangay Didipio, Kasibu, Nueva Vizcaya. At the center of the controversy are the mining operations of Oceana Gold Philippines, Inc. (OGPI), a foreign-owned corporation, with which the national government of the Philippines has entered into a Financial and Technical Assistance Agreement (FTAA). Several residents of Didipio object to the large-scale mining in their area on account of perceived adverse economic and environmental impact that such activity would cause to their community. Majority of the residents in Didipio are indigenous peoples although they are originally from other places and thus cannot directly claim ancestral domain over Didipio. Reports and complaints reached the Commission on Human Rights (Commission for brevity) alleging widespread and systematic violations of human rights committed by OGPI and the security sector against residents opposed to large-scale mining. The tense situation in the area has not abated and seems to be only getting worse. In furtherance of its commitment to protect and promote human rights, and pursuant to its mandate to investigate violations thereof as well as monitor compliance therewith, the Commission took cognizance of this case. After a thorough review of all the information and documents gathered, the Commission finds that, indeed, human rights violations were committed against the indigenous peoples inhabiting Didipio. 2. Require all concerned agencies, particularly the NCIP, the DENR-MGB, the PNP and the AFP, to submit reports to the Commission on Human Rights regarding concrete actions they have taken to respect, protect and fulfill the rights of the affected community in Didipio,within 30 days from receipt of this resolution. Done this 10th day of January 2011, Quezon City, Philippines.